A Gray Ribbon brings awareness to Brain Cancer. 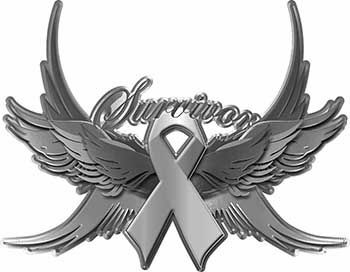 Weston Inks Cancer Awareness products are designed and created to provide inspiration, and strength for cancer survivors and their family and friends. Take advantage of Bulk Pricing on many of our most popular items...great for benefits, fundraisers, or giveaways! Just contact us via email or phone for additional information on Bulk Pricing. The Interior Wall options are much like wall paper but with the adhesive already to go. The interior graphics will not pull the drywall apart if you ever want to take them down. They are not resuable but will not harm the wall. A great idea for the home or gift for any of your friends or family.